So I went to my 36 week appt and walked out a little disappointed. Baby is still high and not dilated whatsoever. My doctor asked me if I wouldn’t mind doing another ultrasound just to check on baby’s growth since I had a 7lb9oz baby at 35 weeks last time. Well of course I said yes! 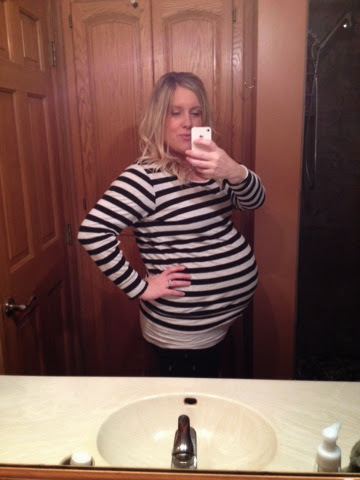 I wanted to see baby again J So the next day Kyle & I walk in for our ultrasound and whaddya know baby sure looks big! Measuring 3 weeks ahead and a whopping 8lbs3oz already. The tech said that could be off by a pound but YIKES.. I still have a ways to go. Since baby was measuring over 90% she said she couldn’t let us leave until she called up to my doctor. He said it was fine to go home and we’d talk about it at my appointment next Tuesday. I knew baby was big but not THAT big! I’m getting really uncomfortable so I hope and pray this baby evicts itself before the 40 week mark!! Also since baby is so crammed in my tummy there was really no room to get a good look or pic at baby’s face or profile L Although Kyle did say it looked like baby had some hair! She of course turned the screen away when she went down to privates! It would be SUCH a letdown to find out this late in the game! 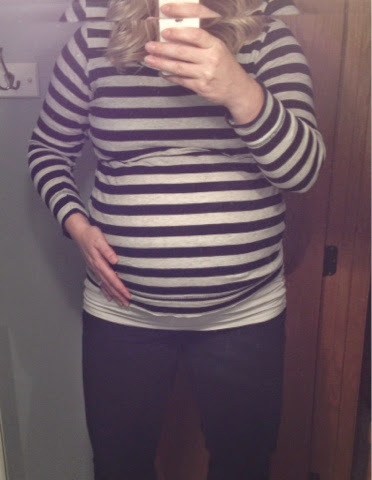 So anyway, now I’m dying to see my doctor next week to see what they think about baby’s size. I’m hoping they say they’ll induce me before 40 weeks if I don’t go in before then because I can’t IMAGINE being preggers for another MONTH!! (fingers crossed).